The Construction Set (CS for short) is a tool that can be used to view and edit the game's data files. It is a very complex and powerful program that cannot be described by a single article. The TESCS Wiki is an entire wiki devoted to documenting the CS, and is the best place to find information about the CS. This article is primarily intended to answer some frequently asked reader questions and explain how the CS is used to provide data for UESPWiki. The CS is an external program that is run separately from the game of Oblivion. The program is available for free from Bethesda. It can only be run on a PC. People who play Oblivion on consoles can install the CS onto a PC. 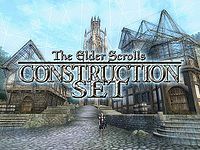 However, without installing a PC version of Oblivion onto the PC, the CS will not be able to access any of the game data and therefore is of limited use. To use the CS, you will generally want to start by loading data files. Once the CS has been started, choose "Data..." from the "File" menu. You should see a list of data files, starting with "Oblivion.esm" (the main data file for Oblivion) and followed by .esp files for any mods that have been installed on the computer. You can select some or all of the .esp files if you wish to view information for those mods; selecting any .esp file will automatically cause the corresponding master file (i.e., Oblivion.esm) to be selected. If you are just using the CS to view data (i.e., you are not planning to make any changes to the game data), you can safely ignore any warning messages about "You have not set a file as the active file". To learn more about how to use the CS, see the TESCS Wiki. The CS EULA can be read here. The information available in the CS generally provides the most accurate data about the game. Almost every Oblivion article on this site relies extensively on data taken from the CS. The attributes (including health, magicka, and soul strength) shown in the CS for an NPC or creature are not used if the "Auto calc stats" option has been selected. Even for non-autocalc NPCs, the attributes do not include bonuses from abilities. In particular, the magicka shown for Altmer and Breton characters does not include the racial magicka bonus. The gold values of enchanted items as shown in the CS do not include the value added by the enchantment. In some cases, scripts override the values shown in the CS. For example, Etira Moslin's mercantile skill is listed as 40 in the CS, but the script MS45Script resets her mercantile skill to 100 at the start of the game. The CS may automatically convert/process data before displaying it to the viewer, introducing errors. For example, the CS always converts The Unwelcome Guest from an on-touch to an on-target spell because the Open effect is specified as target-only. Theoretically, this could happen with other magic effects that have limitations such as target-only, or could happen in sections other than the spell section. One way to test whether this happening is to hit "OK" instead of "Cancel" after viewing an individual record, and then see whether the record is marked as having been edited. All of these cases have been verified, for example, by examining statistics in game using the Console. The in-game values are used in preference to CS values when there is a discrepancy between the two (see the style guide). There are other cases where the CS data differs from information provided by books, NPC dialogues, or other sources of lore. Lore is considered to be less reliable than verifiable statistics taken from the CS (or from the console), in particular because lore can often contradict itself. This problem is particularly noticeable for many faction memberships: the officially listed factions for an NPC do not always agree with the NPC's description (i.e., game dialogue states that Ungolim is a Dark Brotherhood Listener, but he is not actually a member of the Dark Brotherhood faction). The wiki guidelines state that the NPC's actual faction memberships are to be used in articles. The most authoritative place to obtain these memberships is from the in-game Console, for example using GetFactionRank <Faction> to determine whether an NPC is a member of a given faction. This is the data that is directly used by the game to determine the NPC's behavior. Since this in-game data invariably agrees with the CS data (except in cases where scripts have subsequently modified the NPC's factions), the CS is the most commonly used source for faction memberships. The CS is only available to people who play the game on a PC. However, for extracting data the CS is simply used as a tool to view the information within the game's data files. These game data files are identical for players on all platforms (PC, Xbox 360, and PS3). Therefore, the information from the CS is equally relevant for all players of the game. This page was last modified on 31 May 2018, at 07:22.